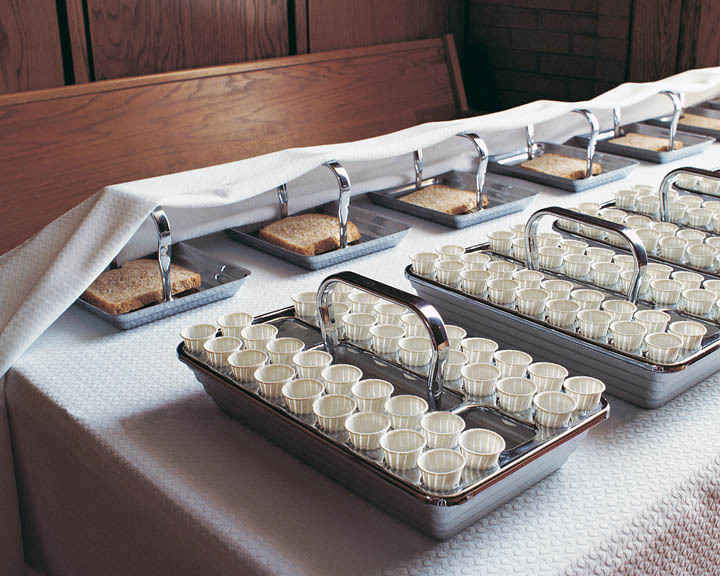 To some extent, I’d always looked at the Sacrament table with its white cloth as a metaphorical funeral pyre. The prayers say we eat and drink in remembrance of Christ’s body and His blood shed for us. I always saw that as representative of His death. And I believe that view has served me well as I’ve contemplated His matchless love and saving grace in my behalf. That singular view changed one Sunday as I sat watching the Sacrament proceedings. The Holy Ghost riveted me to the logistics. At the appropriate time, those who pass the Sacrament stand up and approach the table. Those blessing the Sacrament move the white cloth to uncover either the bread or the water. The cloth covers the entire Sacrament until the appropriate time; then it is uncovered at the appropriate times, and then it is covered again in four stages. 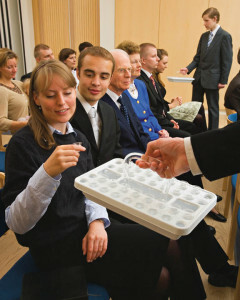 Those awaiting the tokens of the Sacrament come to the table where the covering is removed, allowing them to receive the token from someone with authority to give it. When the cloth moves aside, tokens are received. Suddenly, the white cloth looked like other white cloths in my life. The Sacramental cloth was suddenly a veil. Through that veil, I approach tokens designed for me to think of His physical body: HIM. Instead of focusing on His death and Atonement, I viewed the Sacramental table as a testament that He overcame death through His Atonement. The sacramental emblems represented sanctified tokens of life, for me now, immediately. If I’ve prepared, the bread and water, blessed by the priesthood power of God, sanctify my soul. Sanctify means “set apart as or declare holy; consecrate, free from sin; purify.” It denotes a true remission of sins and the ability to approach the throne of God confidently clean and pure. Sanctification is a prerequisite to celestial salvation. That bodies who are of the celestial kingdom may possess it forever and ever; for, for this intent was it made and created, and for this intent are they sanctified. And they who are not sanctified through the law which I have given unto you, even the law of Christ, must inherit another kingdom, even that of a terrestrial kingdom, or that of a telestial kingdom. 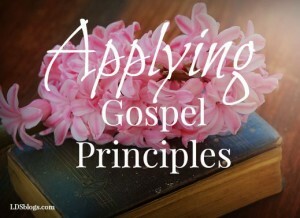 While we generally view obtaining celestial glory as something occurringafter this life, many in the scriptures received the Lord’s assurance in this life (their calling and election) that they obtained celestial glory. Viewing the Sacramental emblem covering as a veil invites this train of thought. The Sacrament sanctifies. Sanctified souls come into the presence of God. Sanctified souls “always have His Spirit,” Christ’s Spirit, with them, because that is the promise of the Second Comforter. Now what is this other Comforter? 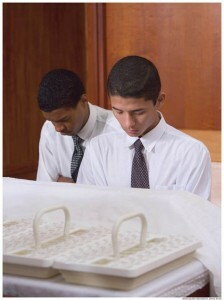 It is no more nor less than the Lord Jesus Christ Himself; …when any man obtains this last Comforter, he will have the personage of Jesus Christ to attend him, or appear unto him from time to time, and even He will manifest the Father unto him, and they will take up their abode with him, and the visions of the heavens will be opened unto him, and the Lord will teach him face to face, and he may have a perfect knowledge of the mysteries of the Kingdom of God; and this is the state and place the ancient Saints arrived at when they had such glorious visions-Isaiah, Ezekiel, John upon the Isle of Patmos, St. Paul in the three heavens, and all the Saints who held communion with the general assembly and Church of the First Born. So as making baptismal covenants is preparatory to receiving the Holy Ghost, keeping those same covenants leads to uncovering the veil through sacramental sanctification preparatory to receiving the Second Comforter, Jesus Christ. The Sacrament is the personal ordinance we repeatedly perform for ourselves alone. 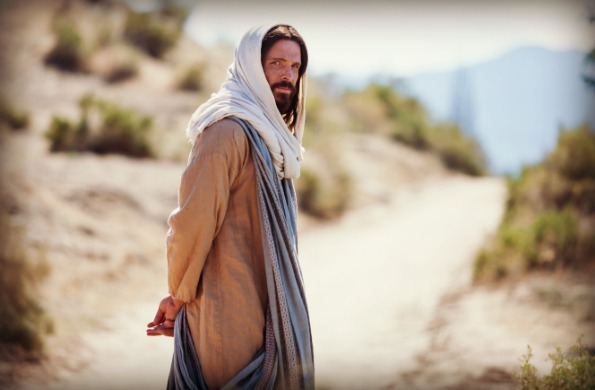 It’s become a repeated reminder, and constant commandment, of the opportunity that awaits “that they may always have his Spirit to be with them” without a veil. Literally. Completely. Forever.